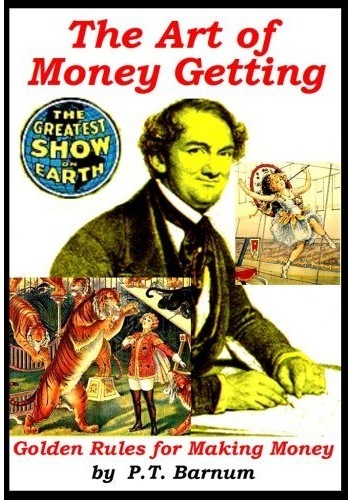 The Art of Money Getting or, Golden Rules for Making Money was originally published in 1880 by P. T. Barnum. Phineas Taylor Barnum was an American showman remembered for founding the circus that became the Ringling Bros. and Barnum & Bailey Circus. Part 1 is below. The twenty other parts will be published daily. Those who really desire to attain an independence, have only to set their minds upon it, and adopt the proper means, as they do in regard to any other object which they wish to accomplish, and the thing is easily done. But however easy it may be found to make money, I have no doubt many of my hearers will agree it is the most difficult thing in the world to keep it. The road to wealth is, as Dr. Franklin truly says, “as plain as the road to the mill.” It consists simply in expending less than we earn; that seems to be a very simple problem. Mr. Micawber, one of those happy creations of the genial Dickens, puts the case in a strong light when he says that to have an income of twenty pounds per annum, and spend twenty pounds and sixpence, is to be the most miserable of men; whereas, to have an income of only twenty pounds, and spend but nineteen pounds and sixpence is to be the happiest of mortals. Many of my readers may say, “we understand this; this is economy, and we know economy is wealth; we know we can’t eat our cake and keep it also.” Yet I beg to say that perhaps more cases of failure arise from mistakes on this point than almost any other. The fact is, many people think they understand economy when they really do not. These extra occasions occur, perhaps, twice a year. In this way the good woman saves five, six, or ten dollars in that time; but the information which might be derived from having the extra light would, of course, far outweigh a ton of candles. But the trouble does not end here. Feeling that she is so economical in tallow candles, she thinks she can afford to go frequently to the village and spend twenty or thirty dollars for ribbons and furbelows, many of which are not necessary. This false economy may frequently be seen in men of business, and in those instances it often runs to writing-paper. You find good business men who save all the old envelopes, and scraps, and would not tear a new sheet of paper, if they could avoid it, for the world. This is all very well; they may in this way save five or ten dollars a year, but being so economical (only in note paper), they think they can afford to waste time; to have expensive parties, and to drive their carriages. This is an illustration of Dr. Franklin’s “saving at the spigot and wasting at the bung-hole;” “penny wise and pound foolish.” Punch in speaking of this “one idea” class of people says “they are like the man who bought a penny herring for his family’s dinner and then hired a coach and four to take it home.” I never knew a man to succeed by practising this kind of economy. True economy consists in always making the income exceed the out-go. Wear the old clothes a little longer if necessary; dispense with the new pair of gloves; mend the old dress; live on plainer food if need be; so that, under all circumstances, unless some unforeseen accident occurs, there will be a margin in favor of the income. A penny here, and a dollar there, placed at interest, goes on accumulating, and in this way the desired result is attained. It requires some training, perhaps, to accomplish this economy, but when once used to it, you will find there is more satisfaction in rational saving, than in irrational spending. Here is a recipe which I recommend; I have found it to work an excellent cure for extravagance, and especially for mistaken economy: When you find that you have no surplus at the end of the year, and yet have a good income, I advise you to take a few sheets of paper and form them into a book and mark down every item of expenditure. Post it every day or week in two columns, one headed “necessaries” or even “comforts,” and the other headed “luxuries,” and you will find that the latter column will be double, treble, and frequently ten times greater than the former. The real comforts of life cost but a small portion of what most of us can earn. Dr. Franklin says “it is the eyes of others and not our own eyes which ruin us. If all the world were blind except myself I should not care for fine clothes or furniture.” It is the fear of what Mrs. Grundy may say that keeps the noses of many worthy families to the grindstone. In America many persons like to repeat “we are all free and equal,” but it is a great mistake in more senses than one. My friend, you need not take that trouble; you can easily prove that you are “as good as he is;” you have only to behave as well as he does; but you cannot make anybody believe that you are rich as he is. Besides, if you put on these “airs,” and waste your time and spend your money, your poor wife will be obliged to scrub her fingers off at home, and buy her tea two ounces at a time, and everything else in proportion, in order that you may keep up “appearances,” and, after all, deceive nobody. On the other hand, Mrs. Smith may say that her next-door neighbor married Johnson for his money, and “everybody says so.” She has a nice one thousand dollar camel’s hair shawl, and she will make Smith get her an imitation one, and she will sit in a pew right next to her neighbor in church, in order to prove that she is her equal. Men and women accustomed to gratify every whim and caprice, will find it hard, at first, to cut down their various unnecessary expenses, and will feel it a great self-denial to live in a smaller house than they have been accustomed to, with less expensive furniture, less company, less costly clothing, fewer servants, a less number of balls, parties, theater-goings, carriage-ridings, pleasure excursions, cigar-smokings, liquor-drinkings, and other extravagances; but, after all, if they will try the plan of laying by a “nest-egg,” or, in other words, a small sum of money, at interest or judiciously invested in land, they will be surprised at the pleasure to be derived from constantly adding to their little “pile,” as well as from all the economical habits which are engendered by this course. The foundation of success in life is good health; that is the substratum of fortune; it is also the basis of happiness. A person cannot accumulate a fortune very well when he is sick. He has no ambition; no incentive; no force. Of course, there are those who have bad health and cannot help it; you cannot expect that such persons can accumulate wealth; but there are a great many in poor health who need not be so. If, then, sound health is the foundation of success and happiness in life, how important it is that we should study the laws of health, which is but another expression for the laws of nature! The closer we keep to the laws of nature, the nearer we are to good health, and yet how many persons there are who pay no attention to natural laws, but absolutely transgress them, even against their own natural inclination. We ought to know that the “sin of ignorance” is never winked at in regard to the violation of nature’s laws; their infraction always brings the penalty. A child may thrust its finger into the flames without knowing it will burn, and so suffers, repentance, even, will not stop the smart. Many of our ancestors knew very little about the principle of ventilation. They did now know much about oxygen, whatever other “gin” they might have been acquainted with; and consequently, they built their houses with little seven-by-nine feet bedrooms, and these good old pious Puritans would lock themselves up in one of these cells, say their prayers and go to bed. In the morning they would devoutly return thanks for the “preservation of their lives,” during the night, and nobody had better reason to be thankful. Probably some big crack in the window, or in the door, let in a little fresh air, and thus saved them. Many persons knowingly violate the laws of nature against their better impulses, for the sake of fashion. For instance, there is one thing that nothing living except a vile worm ever naturally loved, and that is tobacco; yet how many persons there are who deliberately train an unnatural appetite, and overcome this implanted aversion for tobacco, to such a degree that they get to love it. They have got hold of a poisonous, filthy weed, or rather that takes a firm hold of them. Here are married men who run about spitting tobacco juice on the carpet and floors, and sometimes even upon their wives besides. They do not kick their wives out of doors like drunken men, but their wives, I have no doubt, often wish they were outside of the house. Another perilous feature is that this artificial appetite, like jealousy, “grows by what it feeds on;” when you love that which is unnatural, a stronger appetite is created for the hurtful thing than the natural desire for what is harmless. There is an old proverb which says that “habit is second nature,” but an artificial habit is stronger than nature. Take for instance, an old tobacco-chewer; his love for the “quid” is stronger than his love for any particular kind of food. He can give up roast beef easier than give up the weed. Young lads regret that they are not men; they would like to go to bed boys and wake up men; and to accomplish this they copy the bad habits of their seniors. Little Tommy and Johnny see their fathers or uncles smoke a pipe, and they say, “If I could only do that, I would be a man too; uncle John has gone out and left his pipe of tobacco, let us try it.” They take a match and light it, and then puff away. “We will learn to smoke; do you like it Johnny?” That lad dolefully replies: “Not very much; it tastes bitter;” by and by he grows pale, but he persists and he soon offers up a sacrifice on the altar of fashion; but the boys stick to it and persevere until at last they conquer their natural appetites and become the victims of acquired tastes. I speak “by the book,” for I have noticed its effects on myself, having gone so far as to smoke ten or fifteen cigars a day, although I have not used the weed during the last fourteen years, and never shall again. The more a man smokes, the more he craves smoking; the last cigar smoked simply excites the desire for another, and so on incessantly. Take the tobacco-chewer. In the morning, when he gets up, he puts a quid in his mouth and keeps it there all day, never taking it out except to exchange it for a fresh one, or when he is going to eat; oh! yes, at intervals during the day and evening, many a chewer takes out the quid and holds it in his hand long enough to take a drink, and then pop it goes back again. This simply proves that the appetite for rum is even stronger than that for tobacco. When the tobacco-chewer goes to your country seat and you show him your grapery and fruit house, and the beauties of your garden, when you offer him some fresh, ripe fruit, and say, “My friend, I have got here the most delicious apples, and pears, and peaches, and apricots; I have imported them from Spain, France and Italy–just see those luscious grapes; there is nothing more delicious nor more healthy than ripe fruit, so help yourself; I want to see you delight yourself with these things;” he will roll the dear quid under his tongue and answer, “No, I thank you, I have got tobacco in my mouth.” His palate has become narcotized by the noxious weed, and he has lost, in a great measure, the delicate and enviable taste for fruits. This shows what expensive, useless and injurious habits men will get into. I speak from experience. I have smoked until I trembled like an aspen leaf, the blood rushed to my head, and I had a palpitation of the heart which I thought was heart disease, till I was almost killed with fright. When I consulted my physician, he said “break off tobacco using.” I was not only injuring my health and spending a great deal of money, but I was setting a bad example. I obeyed his counsel. No young man in the world ever looked so beautiful, as he thought he did, behind a fifteen cent cigar or a meerschaum! These remarks apply with tenfold force to the use of intoxicating drinks. To make money, requires a clear brain. A man has got to see that two and two make four; he must lay all his plans with reflection and forethought, and closely examine all the details and the ins and outs of business. As no man can succeed in business unless he has a brain to enable him to lay his plans, and reason to guide him in their execution, so, no matter how bountifully a man may be blessed with intelligence, if the brain is muddled, and his judgment warped by intoxicating drinks, it is impossible for him to carry on business successfully. How many good opportunities have passed, never to return, while a man was sipping a “social glass,” with his friend! How many foolish bargains have been made under the influence of the “nervine,” which temporarily makes its victim think he is rich. How many important chances have been put off until to-morrow, and then forever, because the wine cup has thrown the system into a state of lassitude, neutralizing the energies so essential to success in business. Verily, “wine is a mocker.” The use of intoxicating drinks as a beverage, is as much an infatuation, as is the smoking of opium by the Chinese, and the former is quite as destructive to the success of the business man as the latter. It is an unmitigated evil, utterly indefensible in the light of philosophy, religion or good sense. It is the parent of nearly every other evil in our country.